Last year, over 10 days, nearly 300 actors performed in 26 productions of monologues, based on stories from people who have been homeless. The productions were seen by nearly 2,000 people in venues all around Los Angeles, raising approximately $55,000 for The Midnight Mission. 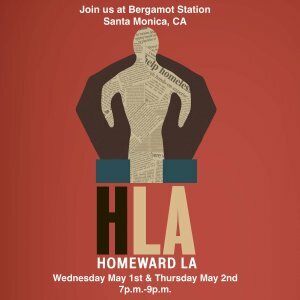 This year, from April 26 to May 5, Homeward LA will be staging new stories from those who strive to find their way home in 50 productions across the city. Join us as we inspire the community to come together and end homelessness. Tickets are $20 and all proceeds go to The Midnight Mission, a nonprofit on Skid Row that provides shelter, food, education and more to LA’s homeless population. If you cannot attend, please consider donating to the cause via the donate button below.